Travertine Window Sills: Are They a Necessity or Luxury? This could be considered a trick question as oftentimes a luxury can eventually become a necessity over a period of time, especially when such luxuries offer useful benefits. Generally speaking, travertine window sills can be looked at as a luxury as you won’t find them on dwellings in lower-cost neighborhoods. This is because the price point for homes doesn’t always cover the cost of such high-end building materials such as travertine. Therefore, it could stand to reason that when building in lower costing neighborhoods, the absolute standard materials would be used to complete the build. Travertine window sills would not be considered among the standard materials. What Makes Travertine Stone an Above Standard Building Material? First of all, travertine is stone, so any type of stone used toward a building project is already considered top grade over wood. Really, anything that can withstand the unpredictable force of the weather along with offering a sturdy and fire-resistant structure is going to produce a quality build that will be able last throughout the ages. Just look at Europe! They have structures that have lasted for centuries and a great deal of that can be attributed to their stone structures. So what does travertine window sills have to do with all of this? Everything. Travertine is a type of limestone—the same kind of limestone that was used to build the Pentagon, Lincoln Memorial, The Empire State Building, Grand Central Station and more—all structures that have stood the test of time since early American history and still look as good as they did the day they were built. To be clear, these famous structures weren’t built with travertine stone. However, because travertine is made from limestone, the distributors at Stonexchange want to give you an idea of how strong, and durable these materials are and if limestone alone is used for such prestigious structures, then you will be able to appreciate the use of travertine window sills even better. Travertine stone is produced in caves and near hot springs. It’s formed over a matter of years—and even centuries. It’s developed in the neutral color tones of beige, cream, and ivory. The travertine that’s produced by hot springs will typically have a little more color as it’s formed near organic material. So it won’t be uncommon to find richer tones here. What Kind of Travertine Window Sills Does Stonexchange Stock? At Stonexchange, you will find that we stock the more neutral-toned window sills here because that is what’s in high demand in today’s builder’s market. Travertine window sills are the perfect stone to keep water away from a building structure. They can be used for exterior and interior design finishings. Typically known for being used as an exterior sill, more builders are appreciating the rustic design and old-world charm that natural stone window sills can bring to an interior space. Travertine window sills can also be used to frame an entire window. While it’s highly recommended to do this for the exterior build, here is where it might be looked at as a luxury should you decide to frame the interior window with travertine sills. 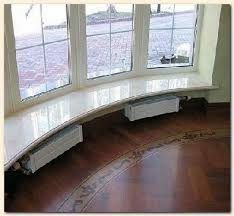 What Size Granite Window Sills Are Available? Stonexchange stocks the standard size window sills measuring in three lengths: 36”, 56”, and 74”. As far as width, it’s measured at 3” to 12 “ in increments of 3”, 4”x 4½”, 5”, 6”, 7”, 8”, 9”, 10”, 11”, and 12”. Should you require travertine window sills that do not fit these measurements, then Stonexchange can custom manufacture the size you need. One thing to take into consideration when you’re ordering a bulk supply of travertine window sills from Stonexchange is that in most cases with our standard sizes, you’ll be able to get your order shipped out to you immediately. Our warehouse is situated in Miami, Florida, near the Port of Miami where we receive a recurring shipment of travertine sills from our quarry overseas in Turkey and other continents. What that means for you is that you’ll never have to worry about running out of stock and should you need an emergency supply of travertine sills expedited to you, then all you have to do is make a phone call and one of our representatives will take care of you. For custom ordered window sills, the manufacturing process will take a little longer. The sills need to be custom cut at our manufacturing plant in Turkey, so there’s a considerable amount of lead-time to fulfill a custom bulk order of sills. Plus, you need to account for the time it takes to bring the entire order to the states by boat. The estimated time to receive such shipments is between 8 to 10 weeks. When you think about the amount of time and effort it takes to secure a supply of travertine window sills, you bSet featured imageegin to understand that it costs to install such a material in a build, but because it’s such a durable type of sill, buyers are willing to pay for it’s benefits because they know in the long run, they will get their money back in regards to upkeep and even when and if they put it back on the market. Travertine sills are a timeless finish, which makes them a luxury product. But for high-end buyers, it might be looked upon as a necessity because they understand the benefit of such a quality sill. If you’re interested making travertine window sills part of your inventory, contact Stonexchange at 305-731-2400 or contact us online today!